PAT Reading descriptor: Identifies the meanings of three simple, familiar words without audio support. 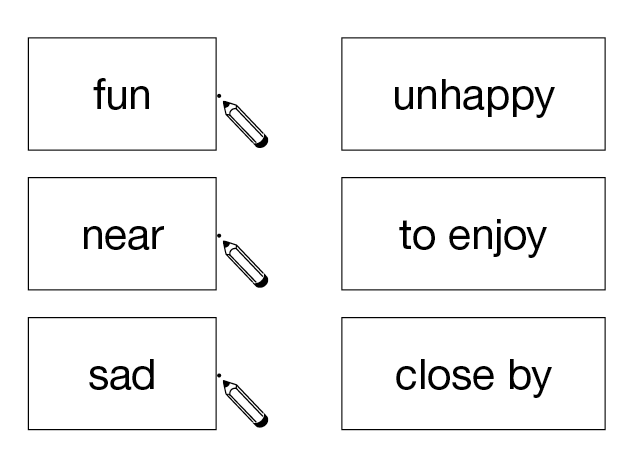 Drag lines to match each word with its meaning. Students match familiar words to their synonyms or simple definitions to indicate their understanding of the meaning of these words. The difficulty of this question type depends upon the familiarity of the words (which they may have to decode) and the level of complexity in the definitions. In the example provided here, the definitions are fairly easy to read and understand.